Ankara (AFP) - Turkey's economy grew 7.4 percent in the first quarter, official statistics showed on Monday, in a reading hailed by President Recep Tayyip Erdogan two weeks ahead of elections but met with caution by economists. The figure, which beat the consensus forecast of 7.0 percent growth, matches the figure for the full year of 2017 and is a boost for Erdogan and his ruling Justice and Development Party (AKP) ahead of the June 24 polls. But economists said such high growth was not necessarily healthy with Turkey running double digit inflation and a bulging current account deficit, and predicted activity was set to slow in subsequent quarters after the elections. First quarter growth was driven by industry, construction and services as well as a rise in exports, official data published by the Turkish Statistics Institute (TUIK) showed. Meanwhile, household final consumption increased by 11 percent. Erdogan, who will seek a second presidential mandate in the polls which some analysts have said may be closer than expected, welcomed the latest data, saying that Turkey "continued to be one of the fastest growing" economies. He added on Twitter: "Despite the attacks on the economy and the games being played, we continue to grow strongly with strong macroeconomic fundamentals!" Erdogan's government has repeatedly accused unnamed foreign powers of conspiring to weaken Turkey and its currency the lira which has lost some 20 percent in value this year. The high growth reading did not help the lira with the Turkish currency at 4.51 against the greenback, losing over one percent in value on the day. The election -- which would give Erdogan beefed up powers under an executive presidency if he wins -- is being held against a troubled background in the economy. Economic policy has generally been a trump card for the Turkish leader who credits himself with taking people to new levels of prosperity since his ruling party first came to power in 2002. But the economy has been plagued by fears of overheating, with inflation high at 12.15 percent in May and the current account (CA) deficit widening. 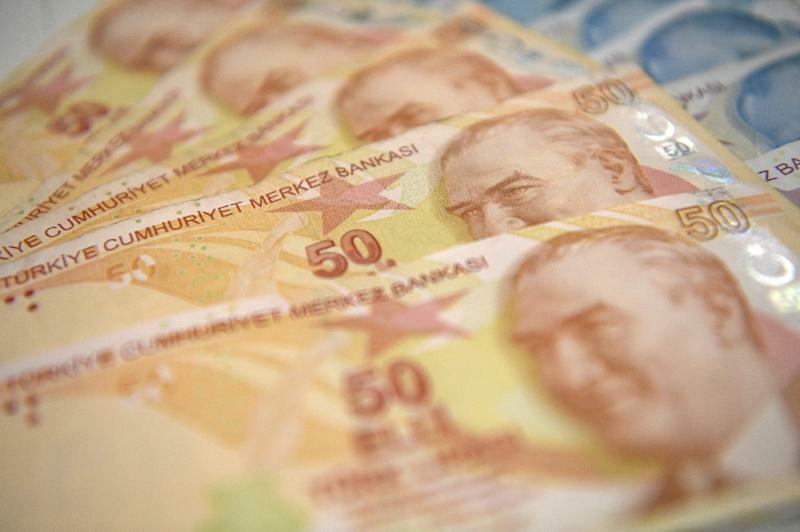 Turkish central bank figures released on Monday showed the CA deficit was $5.4 billion in April, up by $1.7 billion when compared to the same month in 2017, and higher than the market consensus of $5.3 billion. The bank raised rates twice in two weeks after the lira hit record lows and for the first time ever tested the 5.0 ceiling by hitting 4.92 lira to the dollar on May 23. The lira rallied after the bank's emergency 300 bps rate hike in May and another 125 bps increase to the headline interest rate last week. "An abrupt slowdown is on the cards over the coming quarters," Jason Tuvey, senior emerging markets economist at Capital Economics, said in a note. Tuvey warned that tightening financial conditions "on the scale witnessed over recent months" through the rate hikes tends to lead to a slowdown in annual economic growth. For Inan Demir economist at Nomura, the latest data underlined why the Turkish lira had suffered such a steep sell-off in recent months. "In the absence of a policy response against an overheating and imbalanced economy, the currency had to act as the adjustment mechanism," he said. Gokce Celik, chief economist at Istanbul-based QNB Finansbank, cut her 2018 growth forecast from 5.8 percent to 4.7 percent in the light of the latest figures. Celik said the rate hikes would push down growth in 2019 as well because the inflation outlook would mean the central bank is unable to reverse monetary policy tightening "any time soon".